Mack Journell finsihed the day with 14 catches for 149 yards and 3 touchdowns. 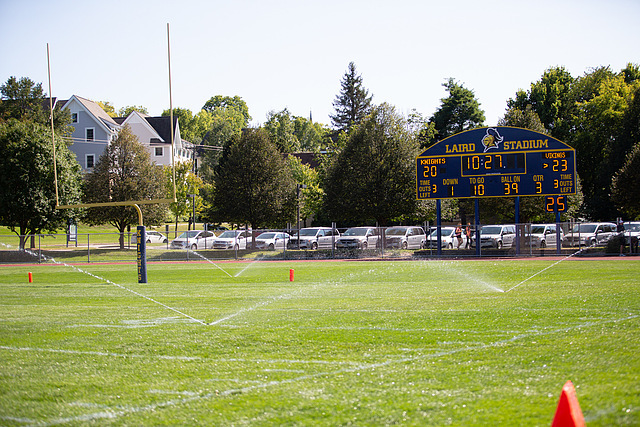 NORTHFIELD, Minn. – In some ways it was a throwback to Super Bowl XLVII as a third-quarter sprinkler delay may have benefited the Carleton College football team in the Knights’ 44-23 victory over visiting Lawrence University. “I’m very proud of our entire organization,” said Carleton head coach Tom Journell. “It was a great team win today. So many people contributed in many ways. Carleton (1-1) raced out to a 20-0 advantage after scoring touchdowns on each of its first three drives, but Lawrence (1-1) found the end zone twice in the final minute of the opening half, then notched another touchdown early in the third quarter to move into the lead. The Vikings went up 23-20 after adding a safety on the next Carleton possession. During the return of the ensuing kickoff, the in-field irrigation system activated at nine locations, forcing a nearly five-minute delay with 10:27 remaining in the third quarter. On one hand it may be fun to say that “Sprinkler-gate” provided just the momentum shift that the home team needed as the Knights scored the contest’s final 24 points to give Tom Journell his first victory at Carleton. More realistically, however, it was improved execution on both sides of the ball that led to the comeback. The offense scored on three of its next four possessions, and the defense forced five punts and notched a pair of interceptions, including a pick-six for Ryan McGregor (Fy./Ellsworth, Wis./Ellsworth) that capped the scoring. Carleton quarterback Christian Zaytoun (Sr./Raleigh, N.C./Woodberry Forest ) went 30-for-49, threw for 305 yards, and matched his career-high with five touchdown tosses. Mack Journell (Jr./Stevens Point, Wis./Stevens Point) was the top target in the passing game this week, finishing the day with 14 receptions for 149 yards and three touchdowns, all career highs. Dylan Rye (Sr./Longmeadow, Mass./Longmeadow) got the scoring started when he hauled in a 14-yard scoring toss from Zaytoun on Carleton’s first drive. Mack Journell followed with TD grabs of six and five yards to push the Knight lead to 20-0 with 12:51 left in the second quarter. Lawrence found the end zone on an 11-play drive late in the second quarter, then an interception set the Vikings up with a short field that turned into another touchdown with only 17 seconds remaining before intermission. Lawrence secured the 21-20 lead early in the third quarter thanks to a 21-yard touchdown pass from D’Andre Weaver to Tanner Morris. After the safety inched the Vikings advantage to three points, the Carleton defense forced a three-and-out following the sprinkler delay. The Knights’ next drive marched 67 yards on eight plays, with a 12-yard Zaytoun to Mack Journell connection moving Carleton back in front, 27-23. Two drives later, Zaytoun found Emanual Williams (Jr./Lovelady, Texas/Lovelady) in the back of the end zone extend the hosts’ lead to 34-23, and Alex Chertoff (So./Brooklyn, N.Y./Poly Prep) chipped in with a 34-yard field goal with 8:39 still to play. On the next Lawrence drive, Ryan McGregor picked off a pass and raced 62 yards up the sideline for the Knights’ first pick-six since 2013. The next Vikings drive ended when older brother Eric McGregor (Sr./Ellsworth, Wis./Ellsworth) picked off Weaver, and Carleton was able to use its backups the rest of the way. Weaver passed for 224 yards and three touchdowns but was intercepted twice. Wasonu Allen led the rushing attack with 81 yards on 10 carries. Jacob Sullivan and Chris Shaw both had touchdown receptions and reached at least 75 receiving yards. Carlos Lua Pineda (Jr./Gresham, Ore./Gresham) paced the Carleton defense with nine tackles, while Spencer Francis (Sr./Hartland, Wis./Brookfield Academy) and Kwaku Bodom (Sr./Brooklyn Park, Minn./Breck) both figured in eight stops. Eric McGregor had six tackles, the interception, and three pass breakups. Next week, the Knights host rival St. Olaf College in the annual battle for the Goat Trophy. Kickoff at Laird Stadium is slated for 1 p.m., and Knights Online will once again feature live video and stats. The sprinklers went off during the third quarter. Carleton would score the next 24 points.